Wish you could instantly transform your ragged yard into a lush green lawn? This is certainly possible if you have the money to invest in having sod installed. In Great Britain, the name “sod” is slang for someone ineffective or lazy. But in agricultural terms, it’s used to refer to a turf of already mature grass that can be placed (or more specifically “rolled” like a new carpet) on top of your soil, where the roots will reattach to the ground and continue to grow. he concept of using sod grass for an instant yard can be quite appealing. In return for the convenience, though, you can expect that you will pay a pretty penny. Sod prices are much higher than growing your own grass from seedlings. Therefore, you’ll need to decide how anxious you are for the result to decide if the investment is worth your hard-earned money. Perhaps you’ve just built a new house and want a healthy lawn to frame it. Or maybe your lawn didn’t survive the harsh winter and you are eager to replace it. If you can afford the sod cost, purchasing sod grass can be an effective way to achieve a perfect lawn instantly. Or, you can also use sod grass to repair small sections of your yard that have been damaged. While purchasing sod can be quite expensive, in return for the sod cost, there are many benefits you can expect. For instance, you will get instant satisfaction from the results, and sod grass can also help protect your yard in those precarious areas where the soil is prone to erode. In addition, grass seeds can take several weeks to grow in, and as long as several years to fully mature, but sod will look attractive right from day one, and it’s root system will take within about a month, offering a permanent solution. 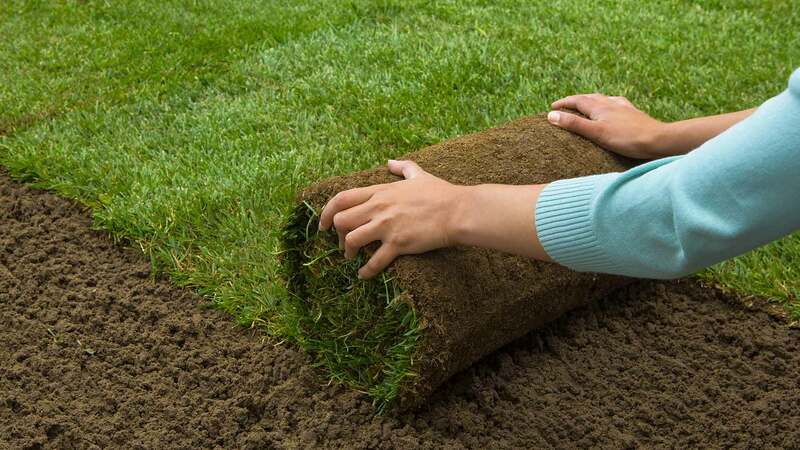 Because sod looks green and healthy as soon as it’s put down in your yard, you may think that once it’s installed and paid for, all of the hard work is done. In fact, the work may just be beginning because sod takes a real commitment in ongoing maintenance to keep it up. This is because sod grass needs to be nourished by the soil in order to thrive and remain alive over time. Otherwise, although the sod grass may appear healthy and vibrant for a few months, without proper nutrients and irrigation, it won’t be able to establish roots in the ground and will eventually dry out and die. Sod grass can also take some time and effort to install it. This is because your site may need to be prepared and you will also need to place the rolls or pallets of the sod so they can reconnect in their new location. Because of the manual labor required for this task, many homeowners hire a professional landscaper for the job. When you’re in the market to purchase sod for your yard, you’ll probably want to consider types of grasses that are locally grown. Therefore, your sod options will depend upon the climate and region in which you live. Or, you might also consider investing in a sod that’s a mixture of a few grass types (such as Kentucky bluegrass, tall fescue and rye grass), which some experts recommend because if one type of grass becomes affected by disease, the other types will likely be resistant to the damage. This gives your lawn a better chance of doing well. If you’re concerned about sod prices and aren’t sure why they are so high, it may help to understand the process that goes into creating this form of pre-grown lawn. There is a tremendous amount of time, effort and equipment required on the part of the grower in order to achieve this perfection. In general, you can expect it to take two years of growth and daily maintenance to create most good quality sod grass. You can purchase sod through a local garden center or landscaping company. Or, you can look for a local sod farmer who will be willing to sell to you without going through a middleman. You can find these types of suppliers in your yellow pages or through ads in your newspaper, or you can do a search online for local options. Home improvement super stores like Home Depot and Lowes can be good places to start your search. You can also sod online and have it sent to you through websites like BuySod.com. Or, contact regional suppliers in your area that sell sod online. Just remember that sod can be expensive to transport so be sure to include this in your price when comparing costs among suppliers. Also keep in mind that the quality of the sod you will find can span a wide range so you’ll want to shop around and be sure to inspect the options first and see how they look first-hand. If you’re wondering about sod costs, there is a wide range of factors to consider. What you can expect to spend on sod grass will depend on what type of sod you select and where you purchase it. You’ll also need to make sure that your soil can support the sod and keep it healthy and thriving. Then there’s sod grass delivery and installation that will also need to be weighed into the sod cost. Keep in mind that transporting pallets of sod can take up a great deal of room and will probably need to be delivered by truck, which can pricey. With all of these variables factored in, you can expect to spend on sod grass prices anywhere from about 15 to 60 cents a square foot. On the low end of the scale, this is usually sod that you purchase and install yourself. The high end of the sod price range will be for sod grass that you have professionally installed. The installation part of the sod price will also depend on the type of equipment the landscaper brings to the task, though, since some commercial companies will have heavy duty equipment that will be especially efficient and can keep costs down, while others will do more manual labor that can be quite time intensive. In addition, the expanse of your yard and how flat and easy to sod it is will also determine how much the landscaper will charge. To put this into perspective, let’s assume you have 2,000 square feet of yard. If the sod price is 25-cents a square foot and you install it yourself, this would cost $500. For the same size yard, if you spent 60-cents a square foot on sod that was professionally installed, this would cost you $1,200. Keep in mind that the delivery and site preparation can be at an extra cost. In addition, if you have a steep slope in your yard or other complications, sod prices for installation can be even higher. So you can spent anywhere from 15-cents a square foot for basic sod grass you will install yourself on up to 60-cents a square foot for premium sod grass that’s professionally installed. When you purchase sod grass, it’s important that you have it cut right before it’s delivered to ensure its freshness. If you aren’t able to plant the sod right away, be sure to ask the grower for recommendations to help it stay in good shape.